I've posted a few screenshots about this in the discords #creations channel but I never went into any real detail on it anywhere. I've done a few tracks before but I'm not really a fan of any of them since they either were unambitious or rushed out. This one though is looking a bit better though so I'm kind of excited to work on something that might actually turn out well. I'm still fairly inexperienced with blender though but I'm learning as I go along. 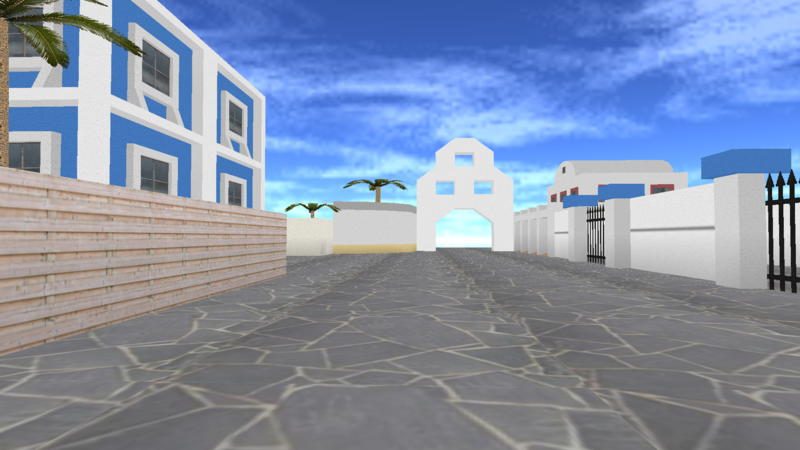 The track I am working on is called Santorini which is, as you may have guessed, based on the island of Santorini. 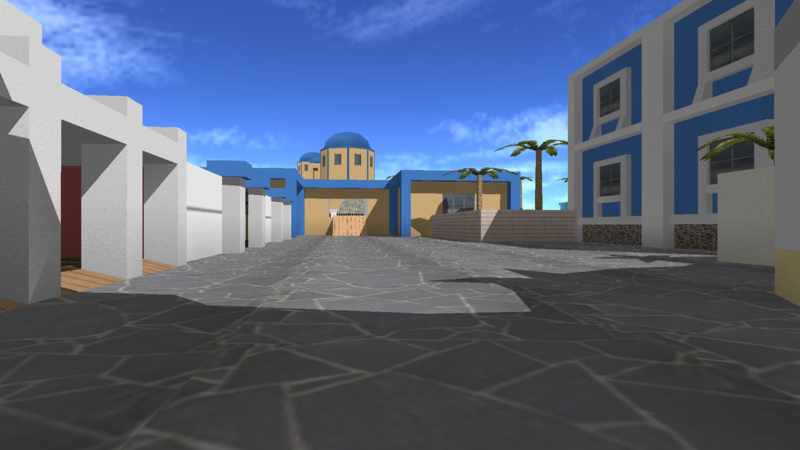 My main inspiration for this will be the CS:GO map de_santorini by FMPONE. 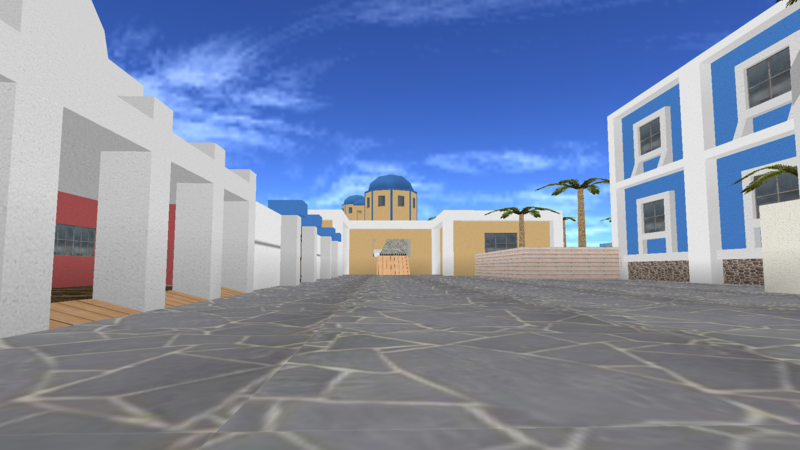 My experience with the setting is next to nothing (I was in Crete years and years ago and that's it) but I've chosen it since I do love how de_santorini looks and feels plus I don't think there is a track with this setting around yet. I planned it out multiple months ago but only about a week ago did I start to work on it. With new idea coming in since then my original plan for the track has been almost completely disregarded and only serves as a loose guideline now. Not like it was any detailed to begin with. I'm looking to update this thread every few days but it's really going to depend on how much progress I make and if I have something new to show so there could be some gaps between posts. We'll see. According to the screenshots you have already done a lot of work, at least for the part of the track we can see on the shots. Nice details on the houses! What exactly do you plan? A raceline in the middle of a town area, or also offroad/beach or something like this? On the second pic I can see a fence and a tunnel - will this be part of the raceline? I don‘t know this CS map, maybe this would already answer my questions. However, looks promising so far! The race is going to go through town. I might add a little garden section but beach/offroad isn't planned. On the second pic you'll be going into the tunnel. The fence is just there for decoration. Can't wait for this one! The track layout looks really nice, I'm sure it'll work well in-game. I'm so curious about the track, I'm gonna download it and play it when it's done. Some more screenshots. The indoor area is going to be darker once I do shadows and on the second pic you can see the roof on the side which I'll fix with visiboxes once I get to MAKEITGOOD. 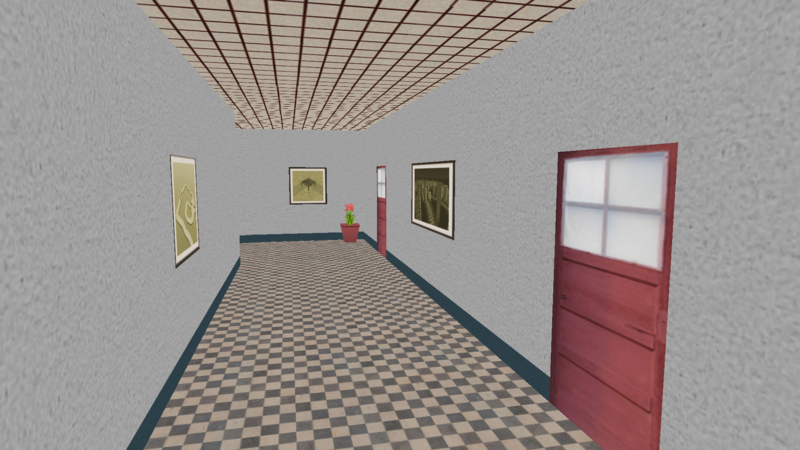 I was initially very worried about how the indoor area would turn out but I think it ended up being pretty decent. Your work reminds me of tracks by Human and Gabor. A really nice and consistent theme with some solid textures. Can't wait until you do the shading! This track looks very promising, can't wait to try it out! Indeed, as Marv said, this screenshots have kind of a Venice/Helios spirit. Can‘t wait how this will look like shaded/lighted. Go, go, go, Alex! This area took a lot longer than most others since I've redone pretty much everything here at least once. The center building in the first screenshot is probably going to get changed too but it's been a while since I've posted something so I thought I might as well post this. Minus that one building I'm not unhappy with how this turned out. 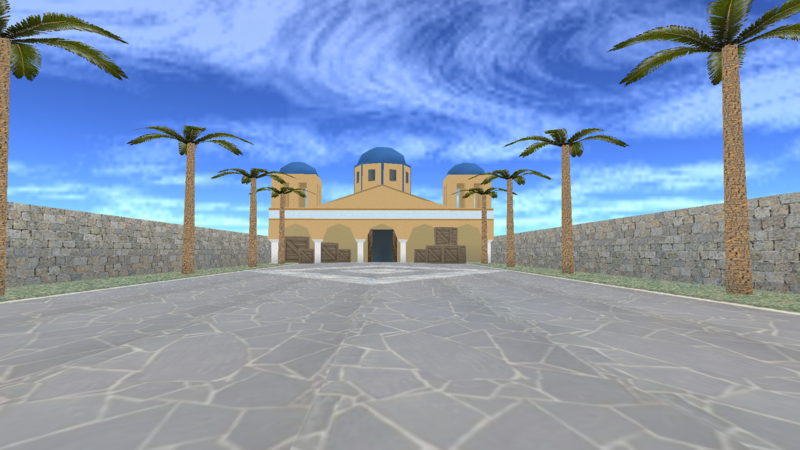 Video of what I've got so far of Santorini. I'd say I'm about one half to two thirds of the way done with modeling the track. After that comes adding shadows and then MAKEITGOOD. How is the raceline looking so far? I am aware of some of the bugs like part of the large orange building being white or being able to see the roof of the inside behind that same building. I'll get to those don't worry. My main concerns right now are that some of the narrow patch are a bit too narrow and that the straight behind the tunnel is too long but I'm not sure so I'd like to get a second opinion on those. Overall progress is a bit sluggish right now since I'm redoing a lot of things over which I'm not satisfied with but I'll get there slowly but surely. Probably. the raceline looks perfect for me - I watched 3 times now, but I have no major concerns about it. The parts you spoke about (narrow path, and straight too long) seems fine to me and give the track some diversity. I like this one jump, and also the last few corners upwards before the end. Do you plan to add obstacles somewhere? At the moment, the raceline is really nice, but also seems a little bit "easy". But maybe this was also the thing you wanted - there are a lot of tracks like this (Helios,...), so nothing to complain about. Also: Will there be some alternative routes, in the end? As far as obstacles go I have added some boxes on the long straight. They are not too hard to avoid though, they're more there to keep you on your toes than to be a difficult obstacle. I initially didn't know what kind of flow the track would have but I have since decided that it will be an easier track with good flow. But there are some parts that are tricky to get down properly with pro cars like the second turn or the second and third turn in the inside area. The video makes it look easier than it is. I still screw up on those sometimes even though I've raced them plenty. Back again after a short hiatus. Been taking a break and now i'm back and motivated again. Raceline is pretty much done. 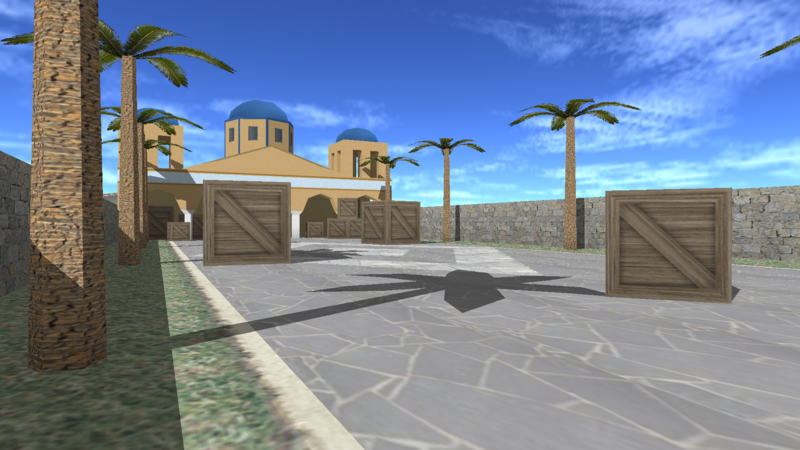 (EDIT: nope, still changing stuff) Walls and scenery are left and then come the shadows after some testing. Modeling is slowly nearing it's end and I'm pretty excited. Only missing shadows now and I'm done with modeling. Maybe a different skybox too. Here come the shadows! It was quite hard to get the shadows inside blender to work but here we are. Still haven't changed the skybox but I'll get to that soon™. Probably. Awesome work, Alex. The track looked super before, but this shadows put it to another level. It looks very realistic. I also love the blue parts on the second screenshot. Your screenshots show, how important shading is. Sadly some classic level doesn‘t have shading at all. I also have to do the shadow cutting on Spa-Volt in the end, and your result will be the ideal I also want to reach. Thanks Kiwi. I haven't done shadowboxes yet and it's something I'm a bit afraid of. Hopefully it will turn out alright. 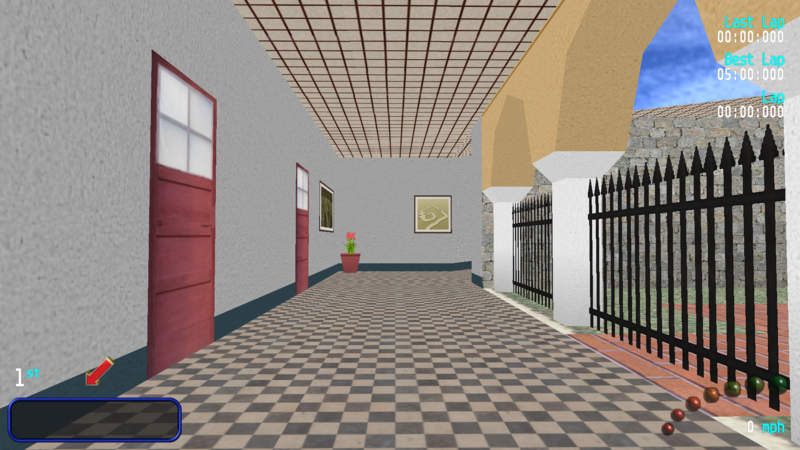 Nearly done with modeling Santorini. There will be some more minor changes but unless something really good comes to me this is it. Makeitgood here I come. That surely looks good. 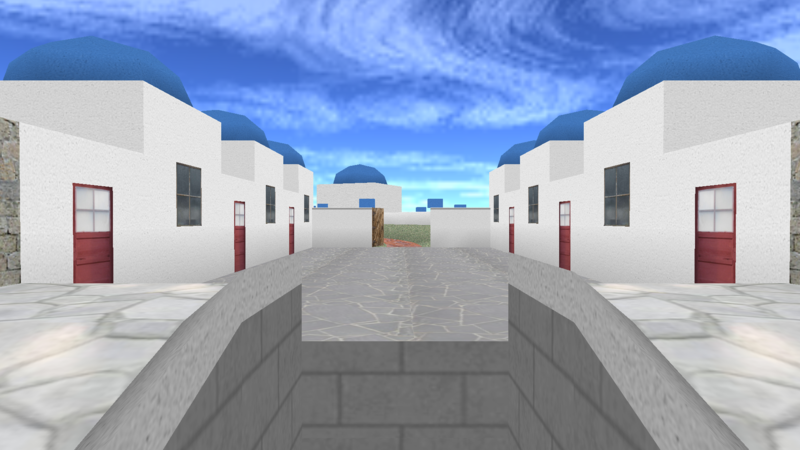 An easy way to really improve the aesthestic by a good chunk is to model a few (low-poly) buildings that look like the ones in Santorini and duplicate them across the track. It looks like something that is floating. After the makeitgood I recommend to add many more plants, this will improve the constrast a bit as well, and by putting plant boxes in corners etc, it will make the track feel less blocky as well. A thing I have noticed as well is that the plants are put perfectly straight. This looks a bit too unnatural, try and put them under an angle, and rotate some of them. Thank you r6te, I will definitely implement some of your suggestions. 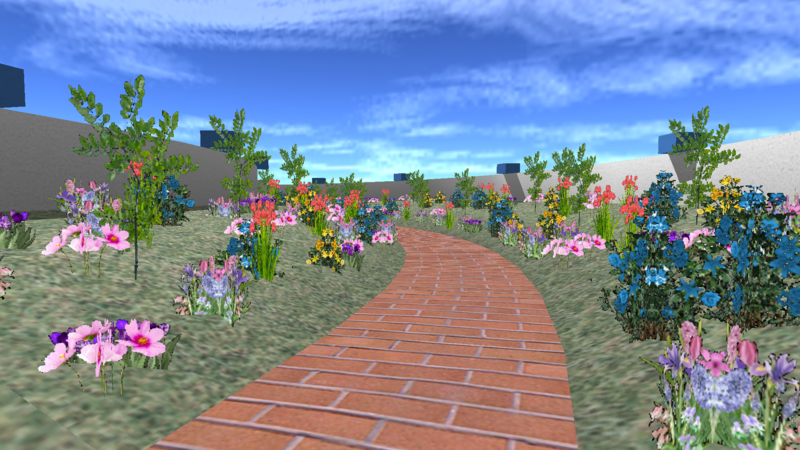 I'm not moving the flower pots though because that would mean that i would have to export the collision again since the last time i exported the .ncp file was before I did the shadows and I don't trust my wacky adventures with the cut tool to not grilled cheese up the collision somehow. Also I'd save multiple hundred polies which is good for performance. 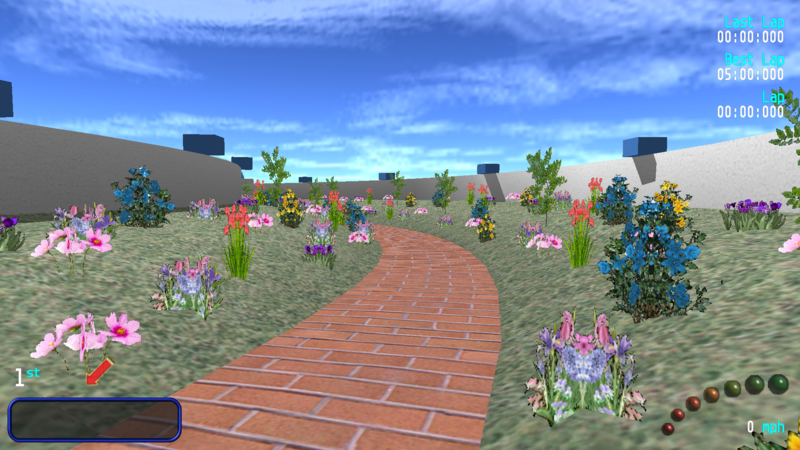 Meanwhile I turned the boring grass field into a slightly less boring flower field. Tell me what you think since I'm not sure about it. I'm still going to add some buildings in the background here like r6te suggested but those aren't in yet. I would say that the grass texture itself could use some odd flowers. Couldn't hurt throughout the map. Hmm, I‘m also not completly sure about the flower field. Two suggestions: Try to arange the flowers a little bit more random. On some places put more flowers per inch, on some places put no flowers at all. Don‘t know how this would look in the end, but at the moment it looks to „straight“, and not very realistic. Hope you know what I mean. And maybe you can also do some vertex painting („darken“) underneath the flowers, to produce a soft shadow, which would add some depth to the scenery. If you place some houses behind the wall and maybe also far in the back, I am sure this will look great in the end. I agree, more randomness in the flowers would probably help. Doubled the amount of flowers and I do think it's an improvement. Still not 100% sure though.